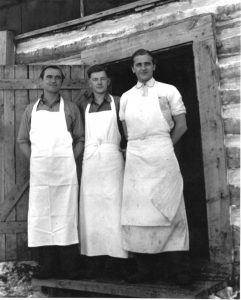 Three POW s who worked in the cookery at Camp 103. Courtesy of Bill Blight. Because pulp camps in Ontario were short of labour, the Canadian government asked for volunteers in an Alberta POW camp to work in Ontario. They were detained in a large camp with little to do, so the opportunity to work in the bush appealed to 330 of them. They came from Alberta by train and were dropped off at Ramsey, Sheahan and Cartier. Camp 103 at Sheahan received 105 POWs and, along with 45 civilians, they built the camps under the supervision of the KVP of Espanola and four military guards. For their work the POWs were paid a daily rate of 50 cents if they cut 1¼ cords, and a dollar if they cut 2 ½ cords of pulpwood. The pulp was hauled out of the bush by horse and then taken by trucks to the Spanish River. According to Blight, they were pretty decent guys. He had a few stories to back that up. Just before Christmas, there was to be a changing of the guard and, for eight hours, the camp was without military guards. The civilian managers remained, including Blight, who was a sixteen-year-old just out of high school. The guards left on the morning train and their replacements were to come on the afternoon train. During that day, Blight noticed there was quite a gathering of the prisoners at the guardhouse, and when he went to investigate, he saw the POWs had the guards’ guns out on the table and were examining and discussing them. However, Blight didn’t have to worry. They were just comparing our guns to the ones they used to have. When he asked them to leave, they did without incident. There were times when a German prisoner became injured and had to be taken to Sudbury for medical treatment. Generally, two of the four guards accompanied him and they all stayed in a Sudbury hotel waiting for the return train to Sheahan the following day. Often, the guards would buy a case of beer and as a result, were hung over the next day. Now it was the prisoner who looked after the guards, carrying their guns. They were hardly the stereotypical prisoners of war we have become accustomed to hearing about. quite appreciate the magnitude of the treasure and so it became a bit battered, experiencing the rough voyage through two generations of Thomson boys. In April of 1946, the POWs were sent to England, where they worked another two years before returning to Germany. In 1996, one of the prisoners, Herbert Ertle, got in touch with E.B. Eddy (the successor to KVP) and came to Canada. When he reached Espanola he was flown in by helicopter to the camp with Blight. They didn’t find much of Camp 103, as it had been burned down in the 1960s. All that was left was some rusted steel, and the outlines of the log buildings. Blight returned a few years later with my nephew, Allen Day, and could barely find anything, due to the deterioration and forest regrowth.